When I walked into the Goodwill Computer store, I wasn’t expecting to find one of the rarest Nintendo Entertainment System (NES) games in existence. Nor did I expect the game to go directly from a Goodwill store to my collection to one of the largest collection of video games in the world. But within one month, it did. In early summer of 2013, I glanced over the modest collection of Zelda catridges in the Goodwill Computer Store display case. $20 for Ocarina of Time, $35 for Majora’s Mask, $15 for The Adventure of Link, $250 for a strange cartridge of the original Legend of Zelda. 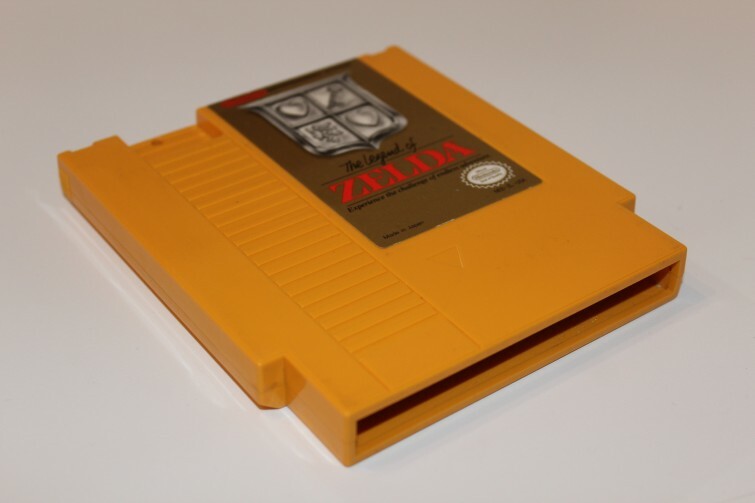 The cartridge was yellow instead of the usual grey or gold. It had the words “test cartridge” written all over the front and back. There was a small drill hole towards the top. I asked the store manager why an original Legend of Zelda cartridge was priced at $250 and yellow. I had a vague idea as to what it might be, but I wasn’t sure. “Well, because… oh, $250. That can’t be right,” he said, taking the cartridge out of the display case and back to his computer to check the database through which they price their electronics. Because this cartridge was rare, it was supposed to be marked $850, but they decided to reduce the price a great deal to make up for the damaged condition. I asked if I could hook up an NES console from the back so that I could personally test it. And sure enough, it booted up with no problem. I spent the next ten minutes comparing the cartridge to pictures on my smart phone of the test cartridges that were confirmed as authentic. It checked out. So I purchased the game for $250 and spent the rest of day cleaning the outside of the cartridge and doing extensive research. What I learned was, at least to me, fascinating. Most gamers probably already know this, but licensed NES games were only produced with grey plastic or, if the game featured battery back-up, gold plastic. Unlicensed carts were produced with black, robin egg blue or sometimes gold plastic. However, Nintendo also produced yellow-plastic carts for internal use at Nintendo Service Centers. These “test carts” were never made available for purchase by consumers. The Legend of Zelda was one of these “test carts,” and it was given to certified repair shops in the 1980′s for testing the functionality of their consoles. According to a friend whose father was a certified NES repairman, certified service centers were only allowed to order two test carts– one to test refurbished NES consoles and one for visitors to demo the game. Supposedly, the reason the cartridge I found had a hole on the top was because it was used on the service shop floor. As an anti-theft effort, the cartridge had a hole drilled through the top through which a chain had linked the cartridge to the console. This also explained why the label atop the cartridge was a bit peeled. According to the aforementioned source, when Nintendo terminated the test cartridge program, they kindly asked shop owners to return the carts for a full refund plus $22.50. Most were returned and destroyed, but some owners opted to hold on to their test carts. The game on the test cart is exactly the same as the one you’d find on any other Legend of Zelda cartridge. Mine had a save file called “Eric,” which proved that the cartridge still had a functioning save battery. Nobody knows the exact number of Zelda test carts still in existence, but very few have been put up for auction in recent years. Because of this, many consider it the most valuable Zelda cartridge in existence (aside from prototypes of the original Zelda), with most recent sales ranging between $500 and $800. Now that I knew the history and value of the cartridge, it was time to make a decision. My first thought was that I really wanted to hold on to it, forever. I’d found valuable Nintendo games in the past, like my complete-in-box copy of Chrono Trigger. But the Zelda cart was an entirely different kind of valuable. I would most likely never see this cartridge again in my life. But because of my shifty living situation, my retro video game collection tends to move around a lot. And the thought of me dropping the game or losing it was terrifying. So I was split between two options: I could either hold on to a highly sought-after cartridge that I’m too scared to even touch or I could sell it for at least $500. I decided to sell it online. I posted the game on a couple of online auction and video game sites and watched as about a hundred offers filled my inbox. Most were lowballs in the $100 range. But within a couple of weeks, I began narrowing down the offers to highest bidders, until I sold it to a buyer for $800. Upon request, the buyer sent me the money without hesitation. And after I sent the cartridge, suspended in layers upon layers of bubble wrap and packaging peanuts, the buyer was ecstatic to add the cartridge to his collection. Because, as it turns out, he happened to possess one of the largest collections of video games in the world. He requested that I not reveal his name, as many retro game collectors are very private about their collections. He asked that I refer to him as simply “a big fan of video game history.” When I opened an email he sent me that included a photograph of his retro game collection, my jaw dropped. His collection includes complete sets of a dozen game consoles (including every retail NES title), over 450 systems, and now his very first Legend of Zelda test cartridge.